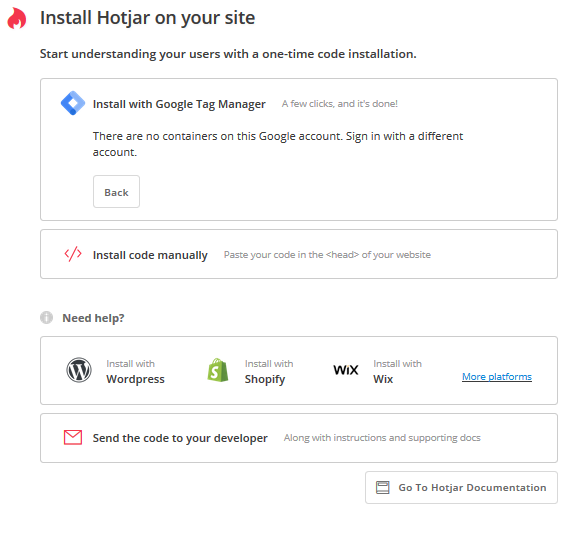 Installing Hotjar for Google Tag Manager (GTM) users has never been easier. Here is how you can install Hotjar straight from your Hotjar dashboard. No need to open Google Tag Manager! Have you installed GTM on your site? 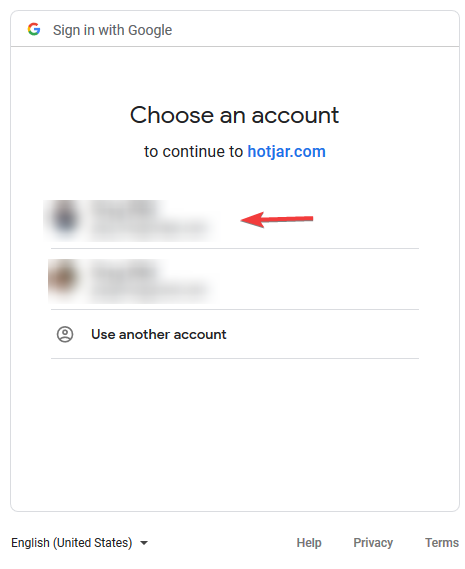 Without GTM installed on your site, you will not be able to install Hotjar using this guide. 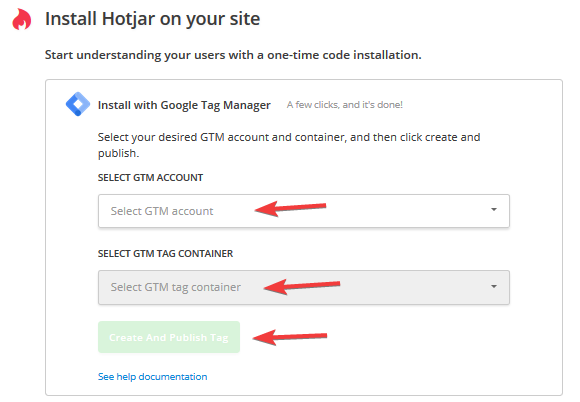 To install GTM before installing Hotjar, check out the official Google guide to installing GTM. 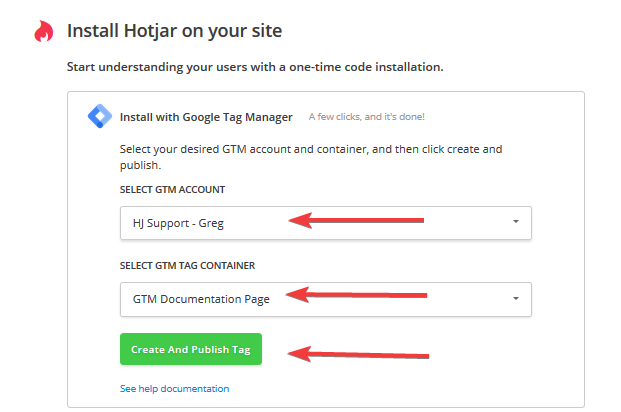 If you would prefer, you can install Hotjar within GTM yourself with our guide on manual installation on GTM. For any trouble that occurs while using Hotjar and GTM, troubleshooting help can be found in our GTM Installation Troubleshooting. Open your dashboard and click on Sign-in To Google Tag Manager. 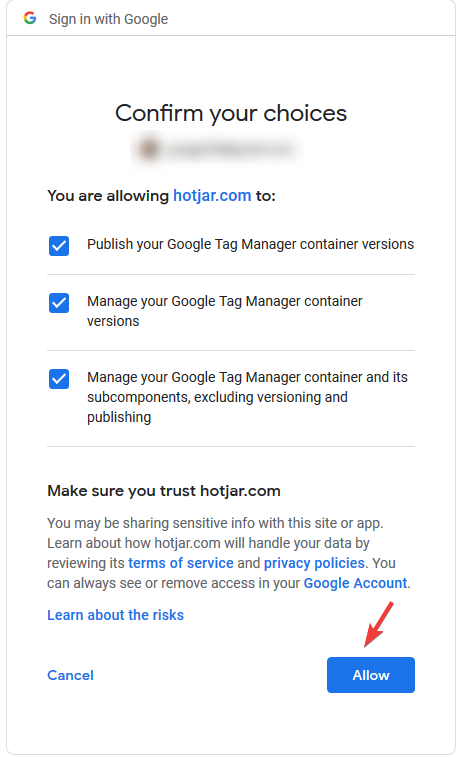 Select the Google account with the GTM container you want to publish Hotjar into. Seeing some slightly different screens here? Google controls all of the steps that involve logging into GTM and granting permission to Hotjar. The exact flow and page appearance may change, but the steps should not change much. Allow and confirm permissions granted by clicking Allow. Select your GTM Account and Tag Container. Make sure you pick the container that is installed on your site! If you install Hotjar into the wrong tag container, Hotjar will appear on the site that the container is installed on. This can include a site with a different URL to what you have in Hotjar. Click Create And Publish Tag. If you have not yet created a container, you will see a different screen. Hotjar will tell you here if you do not have any containers in this account. If you do not, follow the instructions in the official Google documentation. Follow the Verify Installation prompt. You should see a message confirming installation. If you do not, check our guide to verifying Hotjar is installed. Feel free to contact us if you need any help! If you need to revert installing the Tracking Code inside GTM, it's best to follow Google's instructions for installing and removing tags from GTM.